The WeFly! 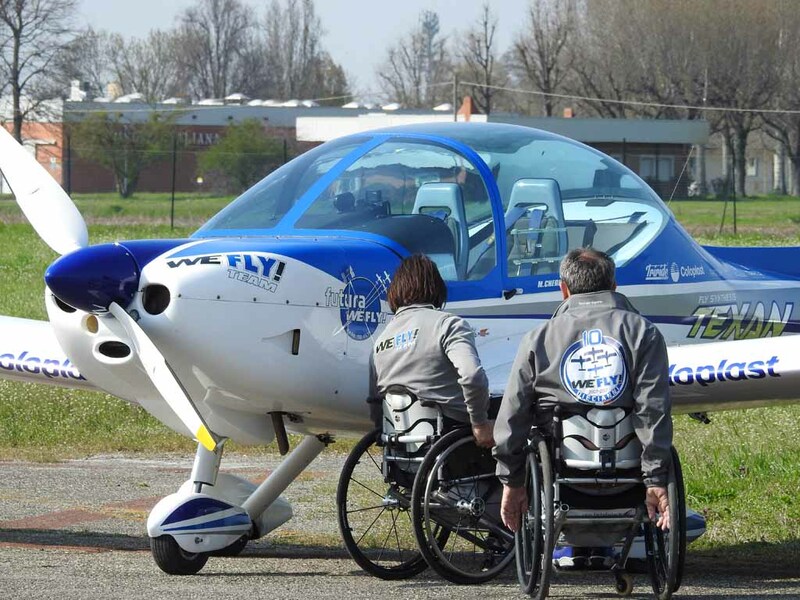 Team is the only air patrol in the world where two of the three pilots are "disabled" and is a flagship of the Italian civil aviation. 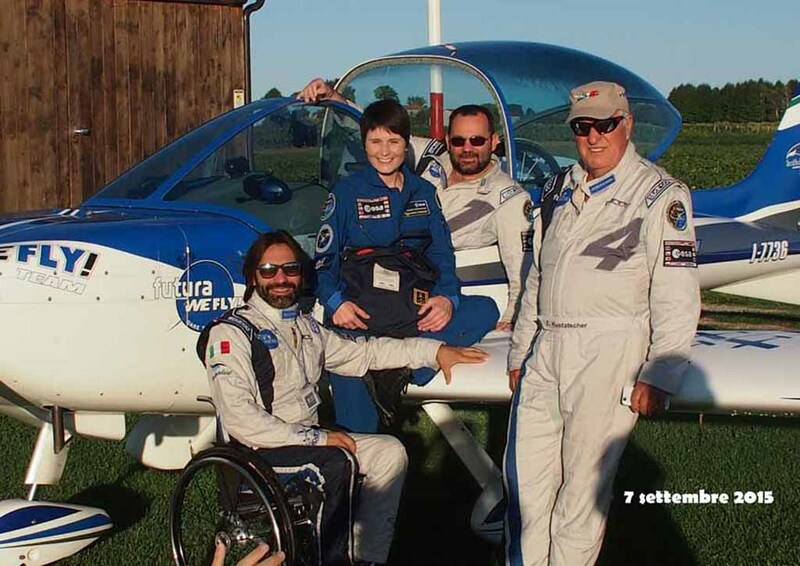 # 1 Alessandro Paleri, leader, with over 2,800 hours / flight, tetraplegic since 1987 and # 3 Marco Cherubini, left wingman, with about 1,800 hours / flight, paraplegic since 1995, they both do not have the use of their legs and fly their Italian ultralight aircraft FLYSynthesis "Texan Top Class", only with their hands, thanks to a special command, designed and built by the same Alexander who is an aerospace engineer. As a right wingman, # 4 Erich Kustatscher, instructor with over 25 thousand flying hours on airplanes and helicopters. 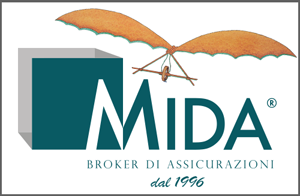 The patrol is completed by: the PR and Speaker, Pino Di Feo, pilot and journalist of the askanews press agency and the pilot and aeronautical photographer, Marco Tricarico. The WeFly! Team was born in 2007 thanks to Alessandro Paleri and # 2 Fulvio Gamba, later disappeared in a flight accident. Therefore, for more than 10 years, as a spokesman for the "Baroni Rotti" national wheelchair pilot Federation, they bring the Italian tricolor to the most important air shows in the world, gaining consensus and success everywhere. The exhibition, which lasts about 10 minutes, does not include real acrobatic maneuvers but a series of evolutions in tight lineup, almost a dance with music that highlights the elegance of the figures and the skill of the pilots, always within the limits of safety and operability of the ultralight, aspects deeply cared by the WeFly! Team. 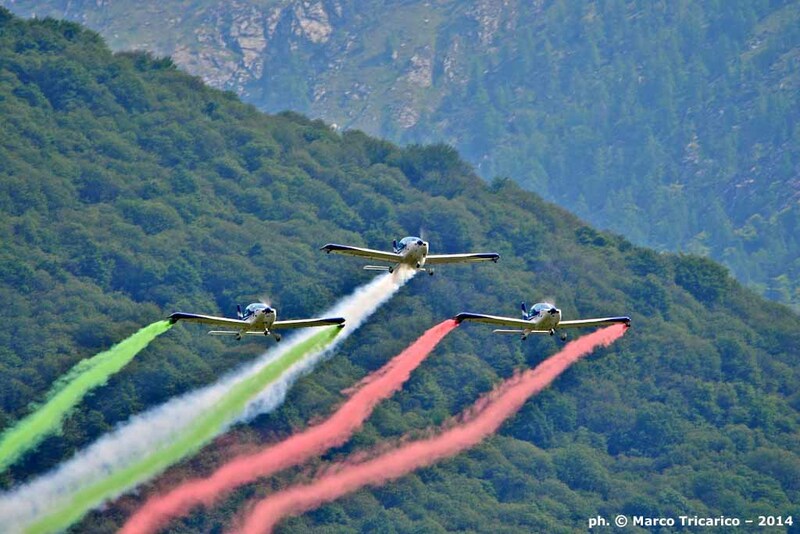 The pilots of the team have all the qualifications required for their activity and their experience is the result of a continuous and constant training, in part also carried out with some pilots of the Frecce Tricolori. All the three pilots have also got private pilot's license (Erich also helicopter); in particular, Marco Cherubini, in May 2016, was the first disabled pilot in history to obtain the PPL license in Italy, at the Aeroclub of Cremona, on a Piper PA-28 aircraft specifically certified for use with adapted controls. During the "Futura" space mission of the ASI, the Italian astronaut of ESA and chief pilot of the Air Force, Samantha Cristoforetti, as part of the initiative "WeFly! with Futura ... dare to fly", brought the flag, designed for the occasion by the famous aeronautical designer Mirco Pecorari, to the space to share with the whole humanity a message of inclusion against stereotypes and prejudices and to witness the strength, courage and determination of these very special pilots. The flag, after flying for 200 days in the Space, was returned to the patrol on 4 June 2016 on the airfield of Caposile (Ve), home of the WeFly! Team, during the 7th edition of the Flydonna event, dedicated to female pilots.